This sub-category was pretty vague and only mentioned 'passports, credit cards etc' in the book. After a bit of research, I also found out anything money related fell into this category as well. Speaking of which - Marie Kondo suggests if you find any loose change around your home, put it straight into your wallet/purse. At the end of the day it is still money, so use it. We found $5 worth of coins in the containers from last week - it all adds up, so pop it in your wallet/purse and spend it. So all I did for this sub-category was cleaned out my purse, which was filled with receipt chits, and re-organised my cards. I have a bundle of infrequently used cards attached to a ring that sits in my handbag if I ever need it when I am out and about. I am going to make it a new habit to make sure I give my purse a clean out at least once a week - and learn to say no to the Eftpos receipts. If I need proof of purchase I can see it on my online banking. Hopefully this will keep my purse clutter-free and I can easily find my cards. Last week I went through my miscellaneous containers and sorted them into sub-categories to make my KonMari Method a bit easier. It's good to know what I am actually dealing with for each category without having to scrummage through boxes and boxes to find stuff. One of the sub-categories I made was Electronics - 'Electronic appliances or equipment' (anything electric really). I was actually amazed at how much 'Electronics' came out of those containers! The 60L was overflowing, and this isn't including the electronics we use on a daily basis. 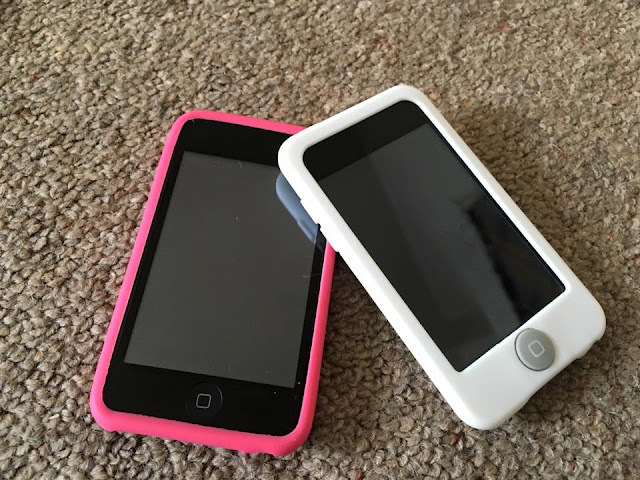 The electronic devices we use on a daily basis spark joy, so we are keeping them (these include my iPhone, DSLR, iPod, Laptop etc). So for today, I am focussing on THIS container of electronics. 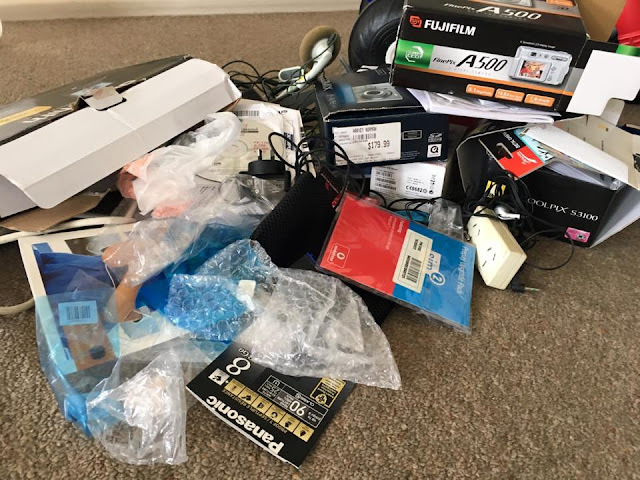 One thing I love about this KonMari method is when I get to see EVERYTHING I own for each category sprawled out on my lounge floor - seeing the full magnitude of the items I have kept for as along as 12 years - is amazing, and often overwhelming. Questioning WHY have I kept all of this STUFF for so long. Are you the same? Can you relate? 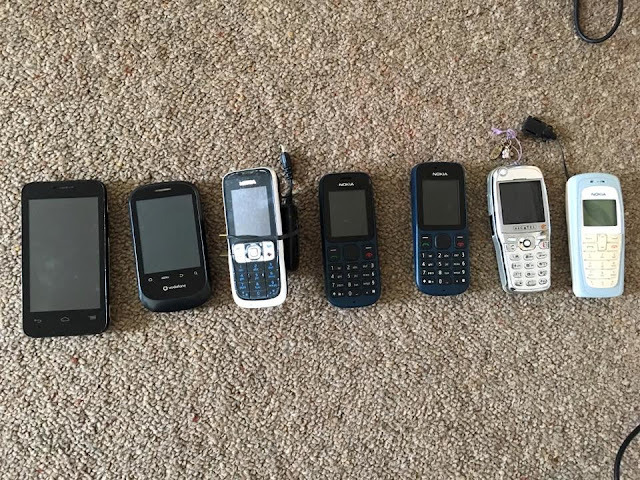 I laughed at loud when I saw the collection of phones I had. Oh how times have changed! The only reason I have kept them for so long is because there are photos and special messages in them I have yet to transfer. Do I even bother? It's a hard one for me. 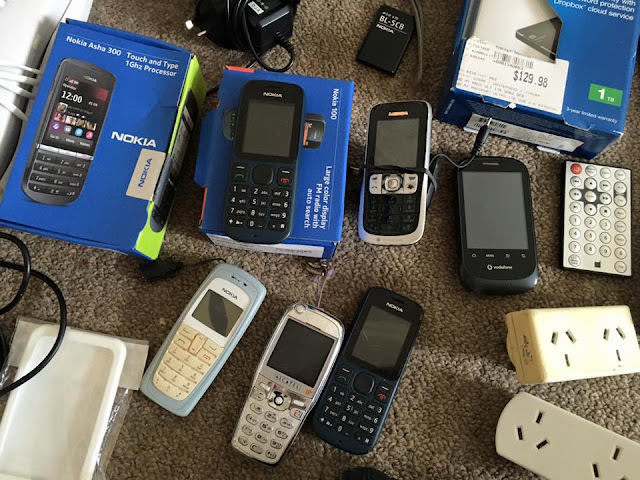 I am going to put my phones in my sentimental pile for now, and will tackle these first, looking at what I can retrieve and make the sure phone is completely empty/re-formatted before dropping them off to a local phone store, who will discard them safely or maybe even recycle. 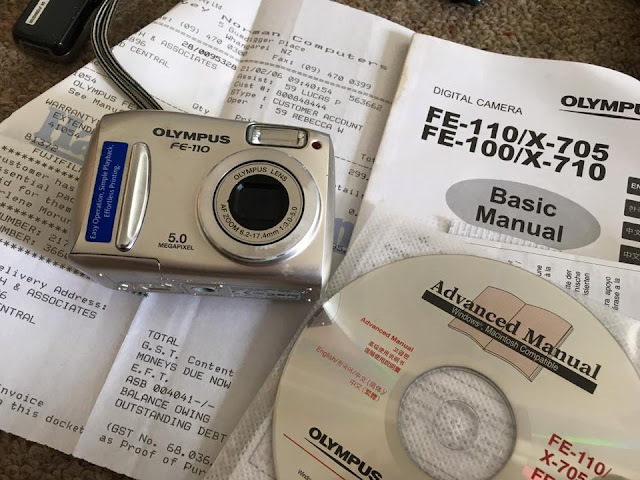 Four unused cameras! Come on Charlene - really? Now I have my DSLR and iPhone, I don't need to keep these cameras any longer and I honestly don't know why I have kept them. Although, I am going to keep the pink one for Miss B, as she loves taking photos, and is pretty good at it too. So I will buy her a new SD card so she can get snapping (maybe an early birthday present). I love looking at the world through her eyes. 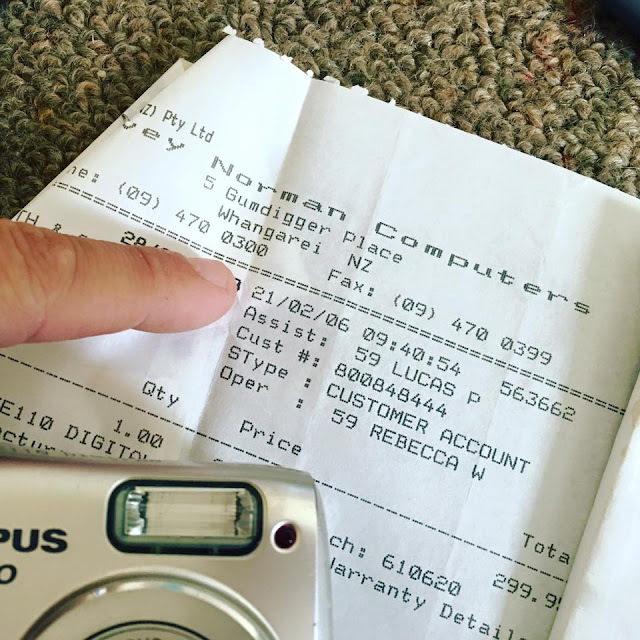 Now, I know I am a sentimental hoarder but this is the icing on the cake - finding a camera, the box, manuals AND the receipt to a camera I bought 10 YEARS AGO (almost to the day) made me realise this KonMari method is EXACTLY what I needed in my life! It's time to 'let it go'! 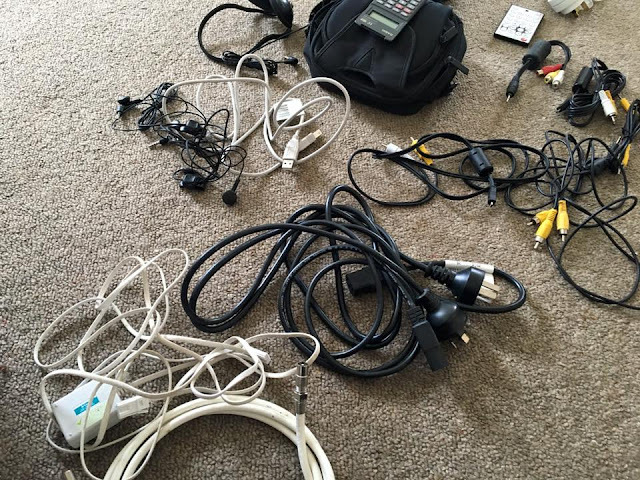 Cords, cords - so many cords! Some I don't even know what they are for. 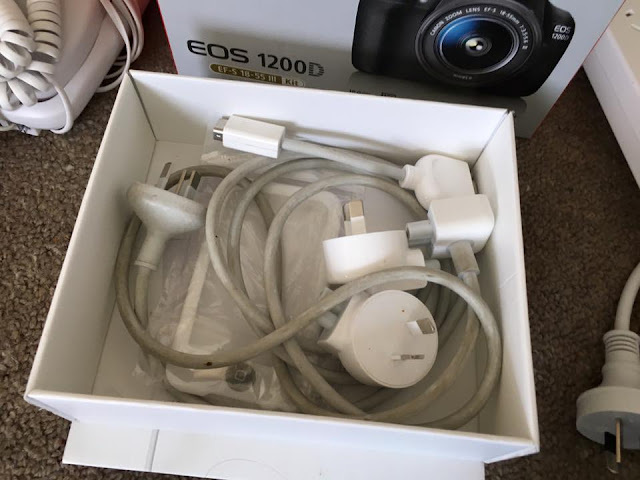 I found about 5 earphones from the mobile boxes - I never use them. 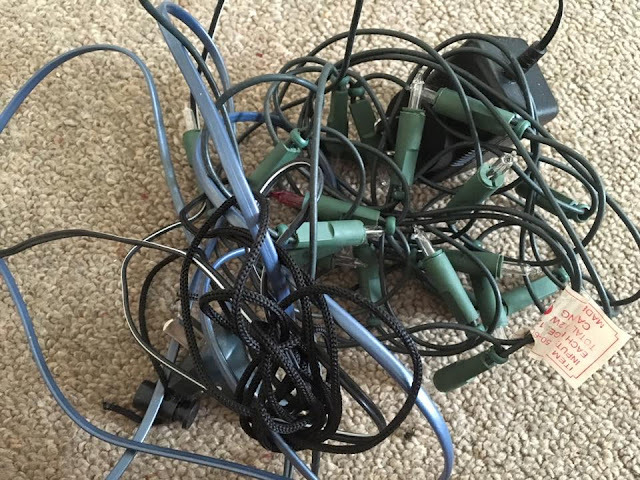 A tangled mess - call me crazy but this actually 'sparks joy' for me because I find it therapeutic sitting down to untangle it! It's the simple things in life. 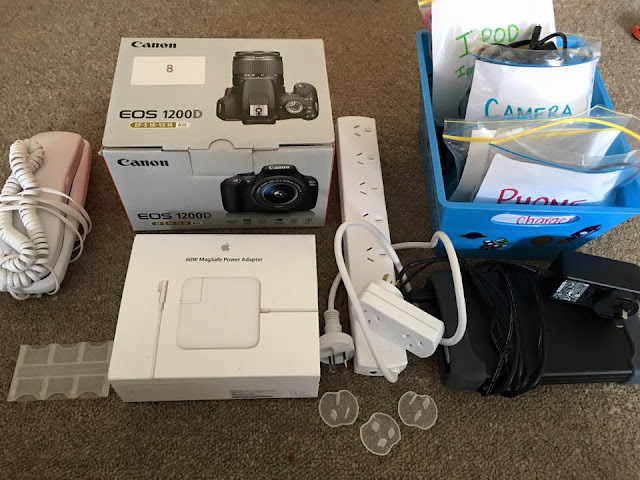 - Phone chargers/camera chargers and iPods etc are organised in this blue container (not shown in before photo), which is stored in our 'family centre'. It makes things easier to find when you add a bag and label. 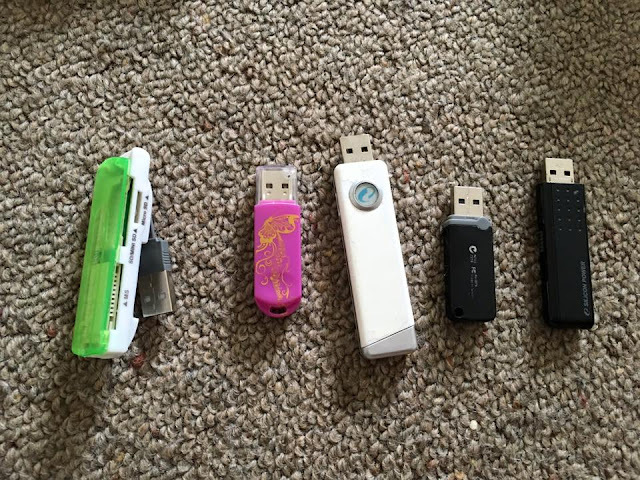 I also have a multi-card reader and four USBs. I need to see what's on them and give them a clean up, transferring anything I want to keep on to my computer/external hard drive and deleting the rest. Then I can re-format them and recycle. 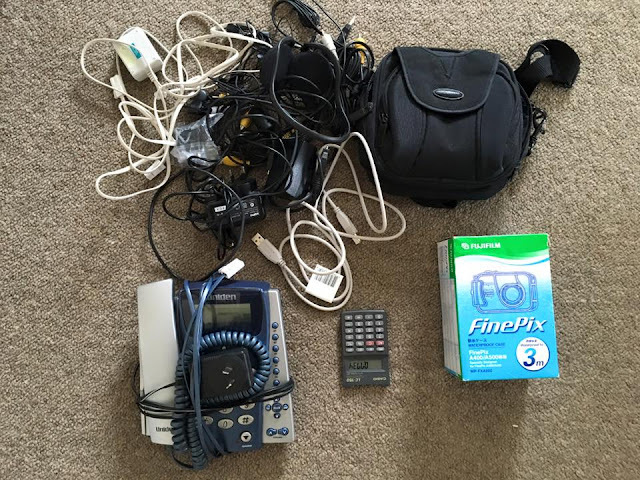 Camera bag, phone, calculator, chargers and cords (we have a couple of places in town that take cords, if not I will discard safely) and I need to ask my partner what he wants to do with the waterproof camera case. It might not look like much, but this is pretty much 3/4s of what was in that 60L tub. Goodbye! So many empty packages taking up space in my home/office! Feels so good to get rid of them! 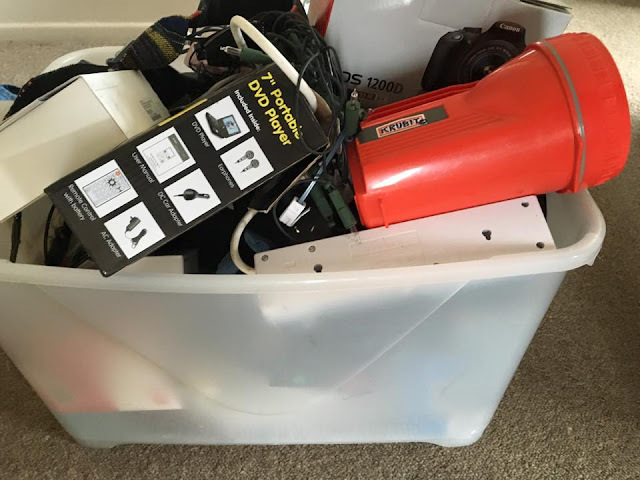 I had been looking at the overflowing container of electronics for days and now I am so glad to have an empty container! It feels great to have purged 3/4 of it and all those packaging boxes! Everything I have kept I use/will use regularly and they are kept in one area, instead of all over the place. Success! I know I have said it before, and I am going to say it again...this KonMari Method is truly LIFE-CHANGING. 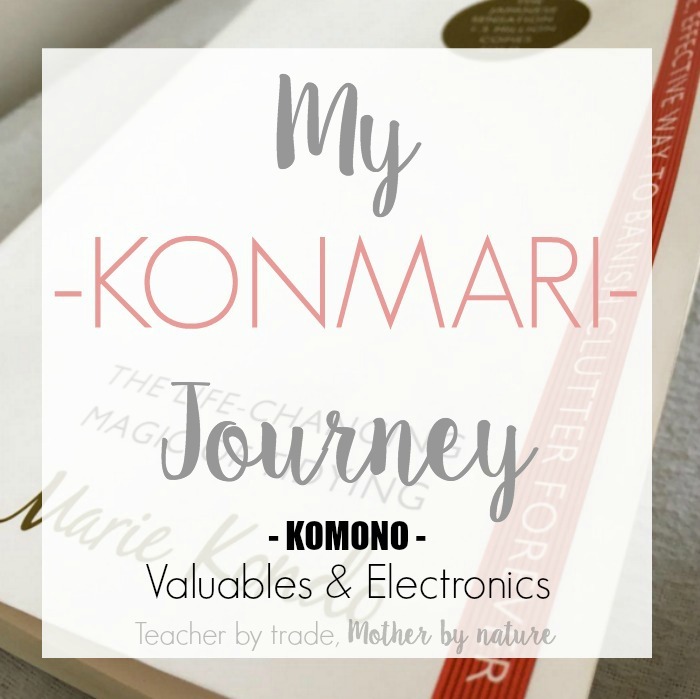 Next: 'My KonMari Journey' - Komono: Household Equipment (including Stationery & Crafts) EEK! This is my weakness! Oh My!! I would have felt overwhelmed trying to sort through those phones and cords. You did so well! We have so many cds that we have never played but I don't want to get rid of them because of the memories they give me. But there is no point carrying on to them. I'd love to know what you do with your cds? It's amazing what we accumulate over the years, and hide!! Felt so good to get rid of it all! tehehehe oh to be a fly on the wall when you tell him. This is awesome, I remember reading a New Zealand Herald article the end of last year. I thought it was awesome and immediately did a massive clear out of mine, my husband's and both my daughter's clothes. Felt so empowering! I look forward to reading through your blog and following your journey. Thank you Sarah! I remember that article too! Go you for being pro-active and giving the KonMari a go! Thanks for your comment and welcome to my blog! What an effective method! I might do a mini version of this too, this weekend. Nothing like getting straight into it! I'm mainly thinking of the cameras I'm no longer using. 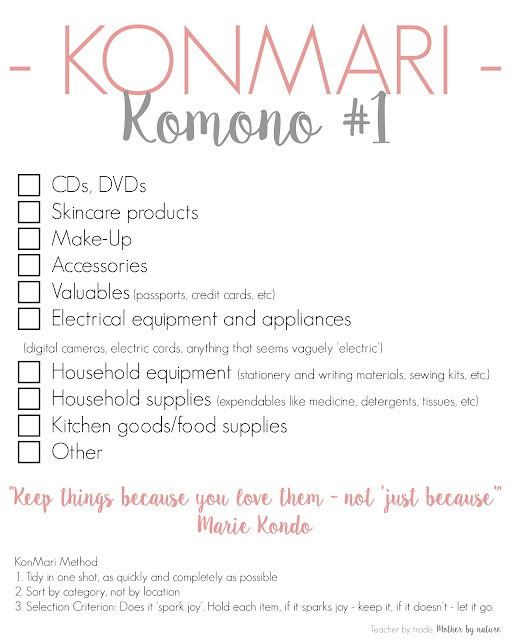 Definitely recommend giving the KonMari method a go! Good luck. You're welcome Shannon and thank you for your kind words! I feel lighter since doing the purge! You can do it Lydia! It sure is crazy thinking about all the stuff we collect and keep over the years. This method is by the best purging method I have used. I recommend it to all. I told you I was 'sentimental' hoarder! ooh yes you totally should! Thanks Jo! I can see the light at the end of the tunnel and it feels GREAT! I didn't even think about that - I should keep one or two in our keepsake box...you hear stories about kids not knowing what cassette tapes are...imagine if they saw a flip phone in 10 years time. I can totally relate. 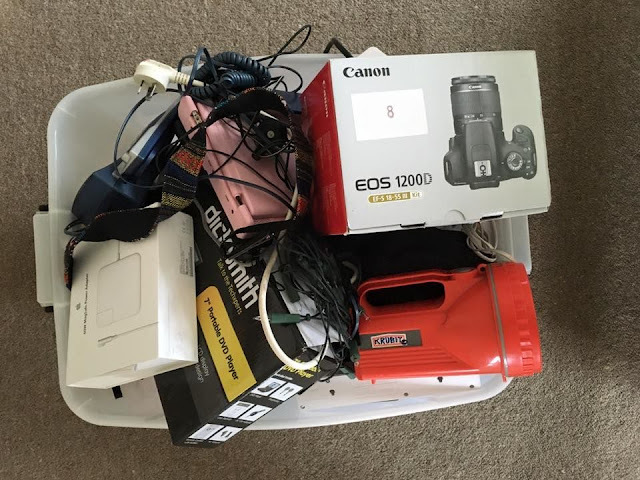 We have boxes of cords, old cameras and the boxes, don't get me started on the boxes! I'm totally bookmarking this and sending it in my husband's direction! You did good! 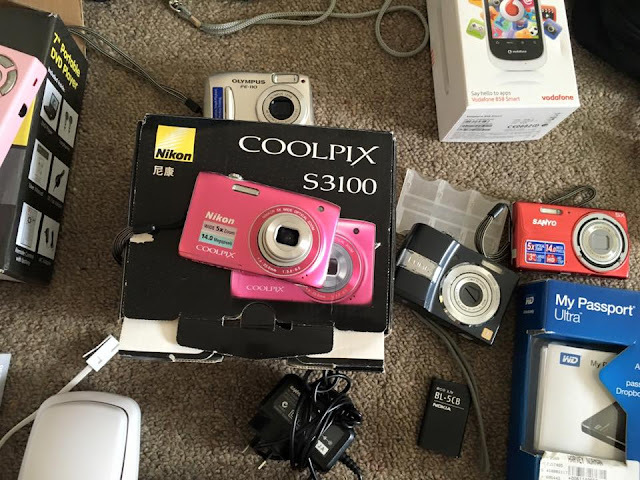 Yaye I'm not the only one who kept mobile/camera packaging boxes!! Thanks Sammie! "I really need to do this. But I need someone to hold my hand ... (Also to tell me which cords go with what and which ones I need to keep LOL) "
My response: Thank you Bronnie for you comment. I came across a couple of cords I didn't know what they were for too...I have kept them for now and hopefully I will figure out what they are for, if not, I will discard. Another job well done, Charlene! 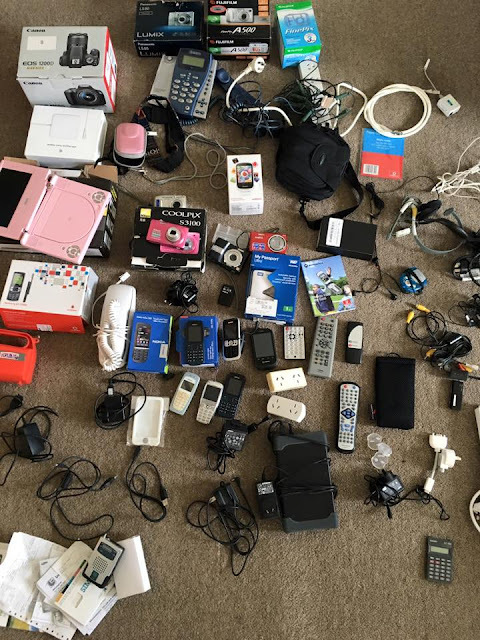 I find it difficult to throw out old phones and cameras too - even the cables that go with them, so I think this is a task I need to do sometime.